When you walk into a jewelry store looking to buy titanium rings for your wedding, you can easily find the right ring size because all you have to do is ask for the ring and then try it on to see if it fits you. Despite the convenience of online shops however, finding the right size can be a bit tricky because you don’t have the option of trying it on for size first. It’s important that you give the online shop an accurate ring size, especially if it’s an international order because shipping takes time, and there could be shipping costs as not all online stores offer free shipping like we do (for orders over $75). If the ring does not fit you, you’ll have to go through all the trouble of shipping it back, paying for shipping costs and then waiting for several weeks yet again before getting your ring. On the internet, you can find printable ring size guides and charts that claim to help you determine your ring size. Unfortunately, in our experience, these usually turn out to be inaccurate because a lot of factors can affect its accuracy such as your printer’s DPI settings and type of paper or paper quality. You could potentially get a size that is a bit big or small for you. The same is true if you make your own ring sizer through the usual strip of paper; or if you use a tailor’s measuring tape to get the right size for your titanium rings, you could end up with the wrong size again. Your best option is to ask the online shop from that you will be getting the titanium rings to supply you with their own ring sizer. This way, you can use the actual sizer that they use, leaving little to no room for inaccuracies. If they do not have one, ask for recommendations on where to get one. One other option that you can consider is to go to your local jeweler’s and ask them to help you measure your ring size. Take note of the size and inform the online shop about it, but that may defeat the purpose of purchasing online. When you order from us, we’ll send you a ring sizer kit that won’t leave any room for doubt. We at TitaniumStyle.com can make your choice of titanium rings, specific to your preferences such as your choice of width, finish, inlays, etc. So it’s vital that we start with the right ring size from the very beginning. 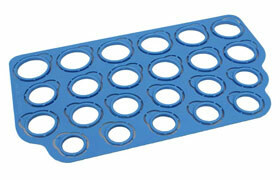 When you order from us, we’ll mail you a free ring sizer kit that won’t leave any room for doubt.